The Malay word orang-utan means “person of the forest.” These long-haired, orange coloured primates are only found in Sumatra and Borneo. They are highly intelligent and close relatives in the evolutionary tree to humans. Orang-utans’ spend the vast majority of their time in the trees of their tropical rain forest home, often sleeping in nests in these trees made from leafy branches. They have even been seen using large leaves as umbrellas to shelter from the rain! An orang-utan’s diet consists mostly of fruit and leaves gathered from the rainforest trees in which they live. Occasionally an orang-utan will eat bark, insects and meat. Food is gathered and eaten during the day. 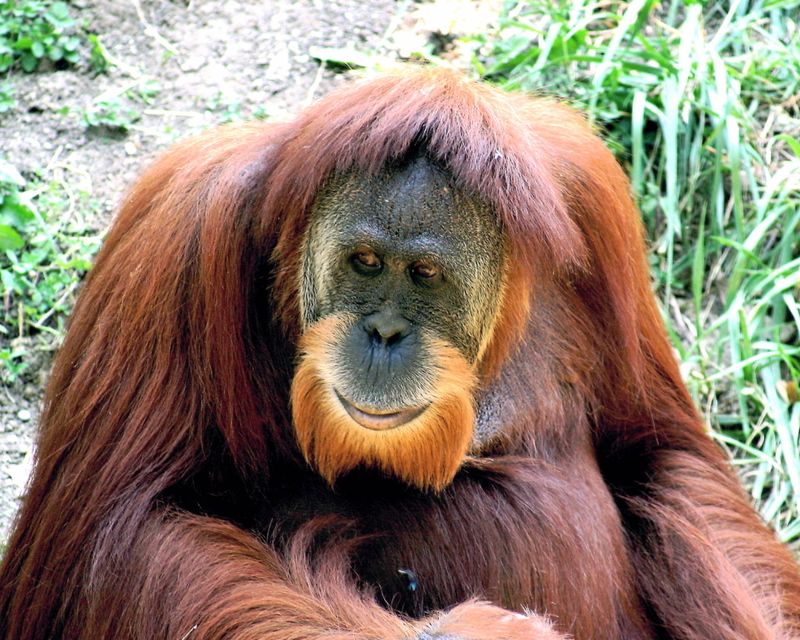 Unlike many other apes, orang-utans tend to be solitary, especially the males. However, mothers and their young share a strong bond, staying together for over 6 years until the youngsters have developed enough skills to survive on their own. Female orang-utans only give birth once every eight years, which is the longest time period of any animal. Orang-utans are long-lived and can survive for as long as 60 years in captivity. Orang-utans only live in a few isolated places and are totally dependent on trees, so they are very vulnerable to logging and deforestation. Sadly, this has placed the orang-utan in greater danger of extinction. Is your weekly shop killing the rainforests? When doing your weekly shop look out for products that contain an ingredient that is leading to the destruction of rainforests, putting the orang-utan at risk of extinction and causing widespread environmental devastation. The ingredient in question is palm oil. It’s surprisingly common in many of the everyday products bought in supermarkets, including biscuits, sweets, confectionaries, margarines, breads, crisps and bars of soap. Palm oil is a cheap source of vegetable oil. The problem is that it is being grown primarily on land that was once home to the vast rainforests of Borneo, the natural habitat of the orang-utan. According to a recent BBC report, it’s estimated that only 3% of the world’s palm oil comes from certified sustainable sources. Further, the International Union for Conservation of Nature estimates that the orang-utan population has declined by 50% in recent decades while the Indonesian government has acknowledged that 50,000 orang-utans have died as a result of de-forestation. It gets worse. Greenpeace has identified the draining of ancient peat lands to make way for palm oil as a global threat, leading to huge amounts of trapped methane being released into the atmosphere. Consequently, Indonesia is now the world’s third largest emitter of greenhouse gases, behind only America and China. Every time a shopper buys a product from a supermarket that contains palm oil he or she is effectively fuelling the destruction of the Borneo rainforests and hastening the demise of the orang-utan. It’s important not to underestimate consumer power. If the supermarkets can’t sell products containing palm oil then demand will dry up. However, supermarkets are in business to make a profit; they will largely ignore their impact on the environment if they can get away with it. That’s not just scepticism on our part. If supermarkets don’t label which of their products contain palm oil then it’s impossible for shoppers to actively exclude them from their shopping trolleys. Surprise, surprise then that current labelling laws allow supermarkets to list palm oil as ‘vegetable’ oil, without singling out the palm oil content, thereby preventing shoppers from identifying it in products. At this point we would like to congratulate Sainsbury’s supermarkets, who have taken a decision not only to single out palm oil on the ingredients list of their own-brand products, but to state directly that it is from a sustainable source. Other supermarkets have made feeble excuses such as arguing that their recipes can change and the amounts and types of oils they use can vary, making more detailed labels impractical. If that were really true, then how has Sainsbury’s overcome the problem?